Marty has been a daycare attendant and kennel tech here since April 2014, her duties have expanded to become our Taxi Expert. She loves “spending time with all different types of dogs in all shapes and sizes.” Marty has four dogs of her own; beagles named Gus and Myles, a mixed border collie named Sammy, and a hound named Winter. When Marty is not at All About Dogs, she enjoys gardening, playing cards, animal rescue and spending time with her dogs and family. Laura joined our team as a Kennel Technician in September 2015, expanding her duties to Taxi Driver in September 2016. In Spring of 2017 she joined our dog training team and was promoted to Dog Training Coordinator in August 2018. Laura enjoys working and interacting with all of the different dogs. 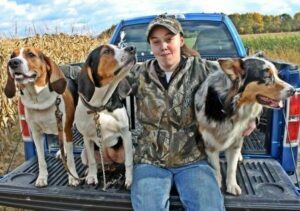 She has five dogs of her own, an Australian Shepherd, 2 Treeing Walker Coonhounds, a Bluetick Coonhound and a Mountain Cur. In her spare time she loves training and competing with her dogs in UKC, AKC & ASCA events consisting mostly of agility, conformation and lure coursing. She also enjoys writing, photography, teaching my dog tricks and being outdoors. Marie is our daycare manager. She has worked at All About Dogs off and on since we opened in 2005. Her favorite part of the job is “working alongside a great group of people and playing with all of the regular pups”. In her free time she enjoys music, art and exploring the great outdoors. Skiy is an operations manager who began working here when All About Dogs opened in 2005. Her favorite part of working here is the dogs and the relationships she has developed with clients. She has two mixed-breed dogs, Luna and Samantha, and a cat named Sahara. She enjoys watching movies, reading, crafting and spending time with her husband, daughter, and pets. Tim is an operations manager who began working here in 2006. He likes meeting new people and their dogs, and “helping those dogs in need and seeing them grow with us, becoming more confident and happy in their daily routines. ” His pets include Gibbs McGee Schlubowski the 1st, a border collie / lab mix. In his free time, Tim enjoys fishing, hanging out by a fire, and spending time with his dog. Deanna is the owner and creator of All About Dogs. She opened the business in 2005, because she wanted a job where she could bring her boxer, Tana, to work. She enjoys meeting clients and their dogs. She and Tim have a dog named Gibbs McGee Schlubowski the 1st, a border collie/lab mix. Tana, the inspiration to All About Dogs, passed away at 14.5 years old in August of 2018. Deanna loves to cook, bike and spend time with her husband and Gibbs. Jessica started here in 2011. Her dedication and hard work has allowed her to work her way up from Kennel Attendant to Kennel Floor Supervisor and now Operations Manager. She most enjoys “watching the different dog and human personalities connect.” She has a pitbull named Weezy. In her free time, she likes to spend time with her family and Weezy. She enjoys hikes and outdoor activities in the summer, and sled riding and staying warm in the winter. Jessie started here in February 2015, as a kennel & daycare tech. In 2017 she became a kennel supervisor. Jessie most enjoys “taking care of all the different great dogs every day.” In her free time, she tries to do as much volunteering with animal rescue and her local pound as possible. She is also attending classes to become a vet tech. Pam wears many hats here at All About Dogs, including doing canine massage, reiki, training, website development, and staff continued education. She has been here since November 2009, and most enjoys “helping our clients build a strong bond with their dogs based on trust, and educating our employees so they can help the dogs be relaxed and happy during their time with us.” She has two dogs, Louie, a lab mix and Wendy, a beagle terrier mix and a horse named Tee Jay. Her hobbies include hiking with her dogs, reading books to learn more about dog behavior and training, pleasure reading (murder mysteries), participating in scent work and Rally-O classes with her dogs. Amanda joined our team in November 2015, she is a registered AKC instructor and CGC and Puppy STAR evaluator and teaches group dog training classes here at our facility. Her favorite part of the job is “teaching the handler the tools they need to show their dog how to be a well mannered part of their family – a trained dog is a happy & confident dog.” She enjoys doing outside activities with her family like raising hogs and chickens, tending a vegetable garden, camping and hiking. She also volunteers with her Therapy Dog at a local home for the disabled. Jamie has worked here as a daycare attendant since 2012. She said the dogs are her favorite part of working here, and her hobbies include sitting by the fire with her son, hiking in the woods, shooting guns at her aunt’s house, and reading. Kara started here in July 2017. She is a kennel technician, daycare attendant, a bather for the grooming department and does overnight care. Her favorite part of the job “All of it! I love getting to meet tons of new dogs all the time and getting to play with them, pet them or just show them any love they might need. There is a lot of cleaning but I know it is necessary to make the pups comfortable.” She has 1 dog named Klondike, he is a Pekingese, Poodle and Chihuahua mix. He only weighs 8 lbs but he thinks he is a big guard dog. Kara absolutely loves music. She enjoys going to shows, playing guitar and ukulele, and collecting vinyl. She also loves writing. One of her goals is to write and edit a book even if she is the only one that reads it. Kelly started here in October 2016, and is a daycare attendant. Her favorite part of the job is “spending time with every single dog and making sure they are safe and happy in their setting .” She has 5 cats named Berlioz, Valentina, Kevin, Bandit & Jovi and 2 dogs named Daisy and Skylar. She loves to read, sing and completing coloring pages. Melinda joined our team in February 2018. She works as a Kennel Technician, Daycare Attendant and Dog Trainer. Her favorite part of the job is “how there is never a dull moment and I learn something new everyday! I also love when I get to have one-on-one time with the dogs and really get to know them.” She has 4 dogs a Puggle, a Chihuahua / Dachshund mix, a Beagle / Jack Russell Terrier mix and a Border Collie / Lab mix. Melinda has a strong interest in animal behavior outside of work. I love to go hiking with my dogs, camping and I have a love for aquatic animals as I own a 20 gallon and 55 gallon freshwater aquarium. I also take my dogs to agility classes. Norman has been a daycare attendant and kennel tech here since August 2018. His favorite parts of the job are “meeting new dogs and getting to know what kind of personality they portray. Seeing new types of breeds and just learning more about dogs everyday! Lastly, I just like hanging out with them. They make me happy and I know they are happy as well.” Norman has a German Shepherd mix named Ava, an indoor cat named Chester and 4 outside, stray kitties named Mr. Whitey, Gomez, Junior and Lorilei that have been around so long they have become part of the family. When Norman is not at All About Dogs, he enjoys listening to music, watching Netflix and YouTube videos. He’s also a big Cleveland sports guy. He plays lacrosse and loves spending time with friends. Holly started here in May 2018, and is a daycare attendant. Her favorite part of the job is “being surrounded by fun dogs and good people.” She has 3 dogs. Two American Bulldogs named Spike and Sadie and a Mastiff named Harley. She loves to read, work out and hang out with friends and family. Julia started here in June 2018, and is a kennel technician. Her favorite part of the job is “interacting and getting to know all of the different dogs. Each one is so unique and it is very rewarding to see them come out of their shell the longer they are here.” She has a Beagle/Lab mix named Penelope that she adopted from Rescue Village. She is very interested in the outdoors. She loves to hike, kayak and bike. She also enjoys playing with her dog and doing DIY projects. Julianna began working here as a kennel tech and daycare attendant in March 2016. In September 2016 she joined our grooming department as a bather. After completing the Basic Animal Grooming Certificate Program at Stautzenberger College, Juliana became a part time Professional Groomer in January 2017. She loves “interacting with the dogs and getting to know them.” She has two Golden Retrievers named Piper and Fletcher. In her free time she enjoys training her dogs and competing in AKC agility and Skyhoundz frisbee! She also enjoys photography and puppy raising service dogs. Jess started here in August 2018. She is a daycare attendant. Her favorite part of the job is “being around dogs all day, getting to interact with such loving animals.” She has 2 dogs, a Beagle named Rory and a mini Aussie Shepherd named Roo. In her spare time Jess loves to write and has published 2 novels. She is also a figure skater. Susan started working here in March 2017 and is a daycare assistant. Her favorite part of the job “getting to know all the dogs and their unique personalities, so I can help them enjoy playing in daycare safely.” She has 2 dogs of her own; Reagan and Alaskan Malamute and Mattie a Yellow Lab. She also has 4 cats. In her free time she works part time as a physical therapist. For pleasure she enjoys reading, gardening and spending time with her family. Andrea started here in 2015, as a daycare assistant and kennel technician. She assisted in the grooming department as a bather while she attended grooming school. In September 2017 she completed the Basic Animal Grooming Certificate Program at Stautzenberger College. Andrea most enjoys “spending one-on-one time with the dogs and giving them extra love.” She has 3 dogs; Sammie, a tea cup Aussie; Niko, a Shih/Tzu Yorkie mix; and a Chihuahua named Peety. Angie joined our team as a Kennel Technician in October 2017. Angie’s favorite part of the job is coming here and pretending that all of these dogs are her own for the day. Her husband thinks one more dog in their household might be too much. Coming here all day and not being allowed to take any of the dogs home clearly works for her marriage. She has three dogs of her own, Jake, Sadie and Louie and one rescue cat named Joey. In her spare time she loves reading, and bargain shopping. She keeps active with yoga, running, Pilates and Spinning. Autumn started here in November 2017, and is a daycare attendant and kennel technician. Her favorite part of the job is “getting to care for all of the dogs and meet new people.” She has a Beagle / Boxer mix named Roxie and a Beagle named Zeus. During her free time she enjoys collecting pennies, mostly wheat pennies and writing poems and songs. Melissa started here in June 2015 and is a daycare assistant and kennel technician. In 2017 Melissa started driving our taxi. Her favorite part of the job “being with the dogs! I love meeting new dogs and getting to know them and seeing my favorite regulars.” She has 5 dogs of her own; Shadow, Cody, Shanna, Prue and Xena and 2 cats named Kacey and Patches. In her free time, she loves spending time playing and hanging out with her dogs. She also enjoys some video games, camping, and spending a lot of time with her Dad and boyfriend. Aly started here in June 2017 and is daycare attendant, kennel technician, bather and dog trainer. Her favorite part of the job is “hanging with the dogs and hopefully making their day a little better while they are staying with us.” She doesn’t currently have any pets but is hoping to adopt a puppy very soon. In her free time she loves to do anything outside such as swimming, hikes, bonfires….everything! She also enjoys hanging out with her friends, just relaxing or finding an adventure. Nina joined our grooming department in April 2017. She loves all breeds and sizes. The most rewarding part of grooming for Nina is the transformation of the dog and knowing that he feels better. Her favorite part of working here is “the beautiful, clean workplace and so many fantastic dogs. The staff is amazingly caring and will go out of their way for any furry friend.” Nina has an American Staffordshire Terrier named Bane and a cat named Widdles. In her spare time she loves spending time with her 3 kids and hanging out with any and all animals. Renee is an operations assistant who has been here since September 2012. She is happy that every area of her job “has something to do with the care and nurturing of dogs.” She has an orange tabby cat named Mr. Pickles; a tortoiseshell cat named Scooter Pants; and a husky named Koda Bear. Her hobbies are arts and crafts, gardening, her Harley, animals and the welfare of our planet. Judy started here in March 2011, and works at the front desk. She most enjoys “the people I work with and the families who are our clients.” She has two dogs Arlo and Maddy and two goats Scout and Oliver. She enjoys working with the bees in her two beehives and decorating.